NO POETRY? NO PARTY! Join us for three days of fiEsta : poetry, visual arts and music. More than 18 artists from Europe, Canada and the US come together in NYC to make history at the first ever maelström fiEstival NYC. Three Rooms Press is proud to be a sponsor of the event, which kicks off May 27th thru May 29th. Since 2007 maelström—a Belgium-based publisher, artist, agent of ideas and propeller of acts—has organized an annual fiEstival of poetry, theater, visual art and music in Brussels. This May, for the first time ever, maelström will ignite the cultural skies of New York City with a three-day creative party featuring such renowned artists as Jerome Rothenberg, Nicole Peyrafitte, Pierre Joris, and Dwayne Morgan, as well an international palette of phenomenal emerging artists. The New York event is part of a touring poetry party that has made stops in Brussels, Quebec and Lebanon in 2009, and Paris, Brussels, New York and Montréal in 2010.
maelstrÖm, already a partner of City Lights San Francisco and publishing Lawrence Ferlinghetti and Anne Waldman in French, goes on building bridges between Europe and USA in association with Three Rooms Press and New Direction Publishing by presenting this first maelstrÖm fiEstival in New York City. The Invisible Dog, 51 Bergen Street. $5 + bring your own chair! Cornelia Street Café, 29 Cornelia Street. $7 + one free drink. Bowery Poetry Club, 308 Bowery. $5 + Belgian specialties. For more details, go to www.fiestival.org or check out maelström on facebook. It’s back! And better than ever. The third annual edition of the very special one-night-only DaDa Poetry Salon, with DaDa hostess Kat Georges! Featured guest poets will include DaDa superstars including boxer/poet Arthur Cravan and dada manifesto creator Tristan Tzara, brought back to life for this special event. Plus: new videos, book giveaways and more. The first 50 people will receive a free copy of the inaugural and only issue of Maintenant 4 (inspired by Arthur Cravan’s 1915 Maintenant magazine, the first ‘zine ever produced!). Included in the FREE zine is a special limited edition CD of contemporary Dada music and Wordscapes. 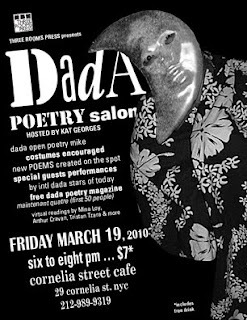 Wear your favorite Dada fashion, bring your Dada-inspired poetry for the open reading (sign up at 5:45, limited spaces available! ).